This book by Juan Peregrina contains ten intense poems written under the heavy influence and effects of brandy. Here the cover and back cover. 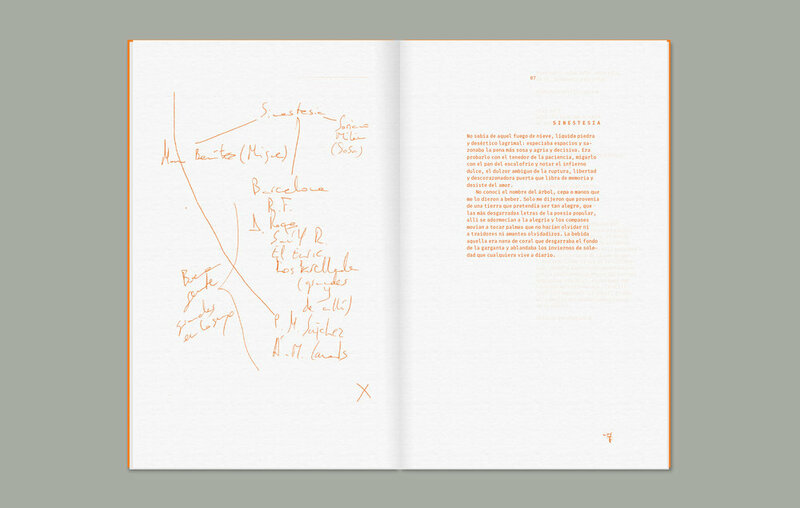 The word brandy comes from the Dutch 'Brandewijn', so this gave me the idea of producing the whole book in orange. The chosen type was Fira Mono. Every text has its counterpart which in this case it is the left page containing the original drafts and hand writing from the poet. We have released a limited run of 200 copies, printed on 300g and 100g of Fedrigoni Arco Print Milk.